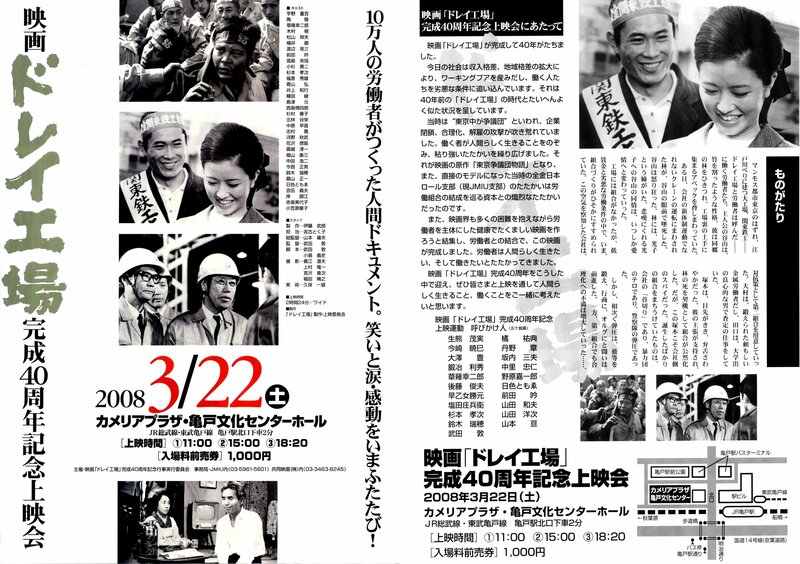 The Jinbōchō Theater is screening the 1968 film Dorei Kōjō as part of its current “Yakusha wa ichinichi shite narazu” (An actor isn’t made in one day) series. This film, starring Maeda Gin and Uno Jūkichi among others, documents a labor struggle in the 1960s in Kanto. It was, in fact, even funded by a labor union. According to the Jinbōchō Theater flyer, Yamada Yoji decided to cast Maeda in his role as Hiroshi, Sakura’s husband, in Otoko wa Tsurai yo after watching him act in this film. That alone is a reason to go see it.